DNA in eukaryotic cells is folded into chromatin, i.e. every 200 base pairs of DNA wrap around a core of histone proteins forming nucleosomes. Both the composition and the location of the nucleosomes play decisive roles in determining the organization of the whole chromatin complex. Moreover, differences in the regulation of the genes encoded in the DNA have been attributed to different chromatin configurations, giving organisms a means to activate specific sets of genes producing a selected set of proteins in different organs, while maintaining identical DNA copies in all cells. In fact, any intervention in the regulation of transcription, including activation/silencing of genes, involves not just bare DNA, but the complex of DNA and histone proteins. Nucleosomes form a highly variant class. Their specific variable features include their positioning on DNA along the double-helix, and the occurrence of a number of post-translational modifications on DNA and histones. The occurrence of post-translational modifications is highly regulated and different characters are found in different organs. If fact, misregulation of post-translational modifications can be the origin of (epigenetic) diseases that can even be transferred from generation to generation. This technology can select and “pull down” sequence-specific chromatin fragments in a non-destructive way. This allows for highly focused analysis. i.e. zooming in on a single gene, of DNA sequences with their intact histone protein endowment. At the core of this technology is a novel DNA-probe oligomer formulation, and a methodology to use it for efficient non-destructive chromatin sequence extraction (nodeChrose). 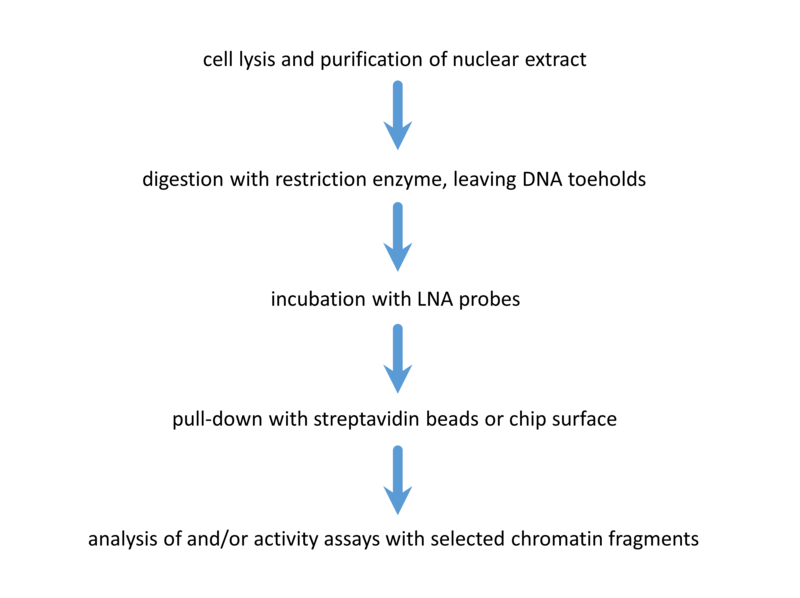 This formulation returns a high-affinity probe which is specific to chromatin fragments embedding a known DNA sequence, the “target”, which is long enough to be unique in the genome (Figure 1). In more detail, the probe is an especially designed oligonucleotide with a target-binding sequence at one end, in which some bases are LNA nucleotides (see “further details”, point (a) ), and at the other end is a covalently bound biotin, which selectively binds to streptavidin coated magnetic beads, allowing an easy pull-down of the extracted chromatin fragments (see “further details”, point (b) ). The extraction process is initiated by the action of suitable restriction enzymes which selectively cut the chromatin chain and expose a short single stranded DNA portion, the “toehold”, where the oligonucleotide probe can at first “land” and bind. Thereafter, a “strand invasion” occurs at the cleaved end of the chromatin fragment (see figure) allowed by the transient opening of the double stranded DNA and promoted by the high affinity of the LNA-modified nucleotides at the oligonucleotide’s end (Figure 2). Most remarkably, the whole nodeChrose process happens at room temperature. Such conditions are permissive for the purification of DNA-protein complexes under “native conditions”, where protein-DNA complexes are interacting as they are within a living cell, without the need for crosslinking agents, and without damage to the chromatin fragment nucleosome structure. 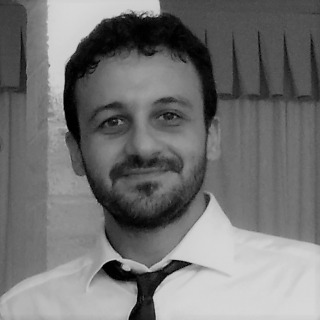 - This technology was originally developed to enable the use of single-molecule Force Spectroscopy on specific fragments of folded DNA/Histone complexes (chromatin), and as such it was already successfully employed, yielding insight on chromatin’s protein content and characteristics (this is reported in the upcoming scientific publication). Figure 1: Design of the probe and generalized mechanism for the invasion of the probe into the target. The target is cut with a restriction enzyme creating DNA-toehold of 4 unpaired nucleotides. The probe consists of an 18 base pair overhang (complementary to the target sequence), a DNA hairpin where a modified base can be incorporated (e.g. a biotin), and a stacking sequence that caps the open end of the target. To increase the affinity of the overhang of the probe to the target sequence contains six LNA bases (colored in red). The mechanism of strand invasion can be summarized in four steps: 1) An endonuclease cleaves the target sequence such that a toehold appears. 2) The probe binds the target at the toehold. 3) Fraying of the double stranded target DNA adjacent to the probe drives strand invasion. 4) A stable hybrid between the probe and the target is acquired, which can be further purified by affinity purification. Figure 2: Experimental flow. First, the sample containing the DNA of interest is cut with a restriction enzyme, creating the toehold. 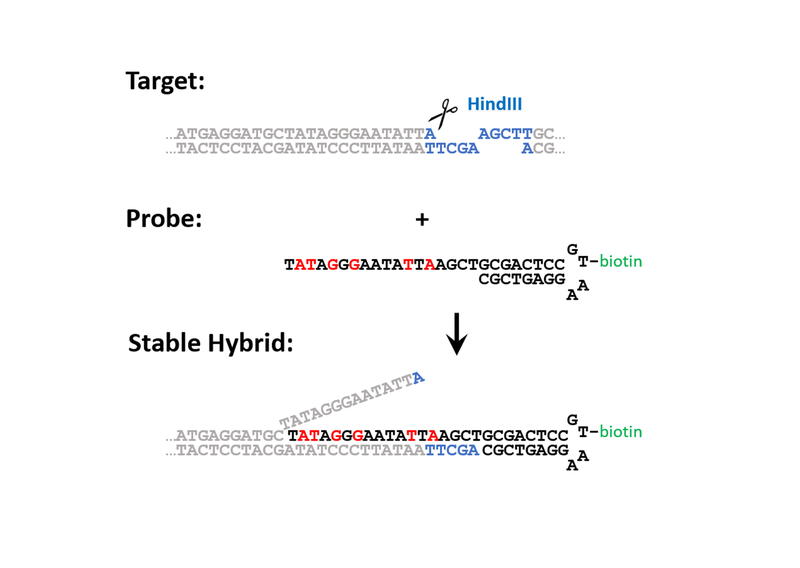 Subsequently, the sequence specific probe containing the ligand for immobilization is added, so probe-target hybridization can occur. After this, the target can be pulled down with magnetic beads, or alternatively, immobilized on a surface for further analysis. 2. Diagnosis: what does the chromatin landscape look like for a particular gene? Variations in chromatin composition have been linked to a variety of diseases. 3. Drug lead discovery in the field of epigenetics: once able to purify native chromatin fragments, one has the proper substrate for epigenetic enhancer/silencing factors. These could be used to identify compounds that interfere with such tasks. This technology is already available for exclusive and non-exclusive licensing for commercial use, or for evaluation. However, should relevant opportunities for co-development present themselves, they would be surely taken into consideration too. The use of high temperatures (80°C) to separate the two DNA strands and to allow oligonucleotide probes to clasp a target DNA sequence. While efficient, these methods denature completely the histone proteins and dissociate them from the DNA, with a total loss of all epigenetic features. The artificial creation of nucleosome structures in extracted DNA sequences. Although useful under many respects, these methods do not provide any specific epigenetic information, in that the obtained artificial chromatin does not reflect the chromatin in the living cells. Chemical cross-linking. This keeps the proteins attached to each other and the DNA, but inhibits further activity of analysis as the proteins are chemically different/non-functional. Moreover, chemical crosslinking is known to introduce artefacts. Bulk, averaged analysis, which obviously hides variations between chromatin compositions. An International patent application was filed in May 2017.